We have made progress in reducing tobacco use among youth in Florida. However, according to Florida Department of Health Florida Youth Tobacco Survey (2015) too many young people are still using tobacco and other nicotine products. Youth are vulnerable to social and environmental influences. Messages and images that make tobacco use appealing to them are everywhere. Prevention is critical. Successful multi-component programs prevent young people from starting to use tobacco in the first place and more than pay for themselves in lives and health care dollars saved. 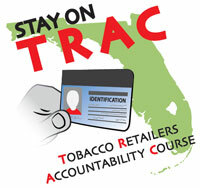 To assist with prevention efforts, the Florida Department of Children and Families contracted with the Florida Certification Board to develop an information video, tobacco retailer training course and marketing scan report. Video Information Sheet - Flyer and links to youth tobacco prevention/education video. Vendor Course Flyer - Flyer and links for an online certification course for tobacco retailers. 2016 Tobacco Marketing Environmental Scan Report (TMES) - The Florida Certification Board coordinated this survey under contract with the Florida Department of Children and Families. The TMES was designed to examine and report on several major areas relating to tobacco and other nicotine product marketing. 2015 Florida Youth Tobacco Survey - Florida Department of Health flyer. Interactive Database - Florida Department of Health Youth Tobacco Survey database and materials.